This morning as I was contemplating what to write about next here in blogland all I could think of was showing all you lovely people my Nanna's lemon meringue pie recipe... which let me tell you, is fab-u-lous! Completely. Truly. However, I realised upon gathering up this idea that in order to get a photo of its greatness to convince you all how wonderful it really is.... that I would have to cook... and not be lazy. Sigh. So instead of showing you all the best recipe in the world, I will showcase my lovely Nanna's talents in another way. By letting you see her sewing skills. By the way, I was playing the guitar and left it lying there before I took this snap... I swear I didn't intentionally put it there to make the photo prettier...lots of giggles. This is another of her creations. It is completely enormous and hangs down the wall of the staircase. HUGE and super cute. I'll leave you with one last snap of my kitten on the quilt... you know I have to. Any pictures of Duke must be uploaded! I love your quilt. 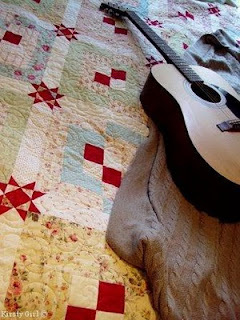 I have always had a thing for quilts, yours is beautiful. Also, love little Dukey boy. Love the little kitty face. 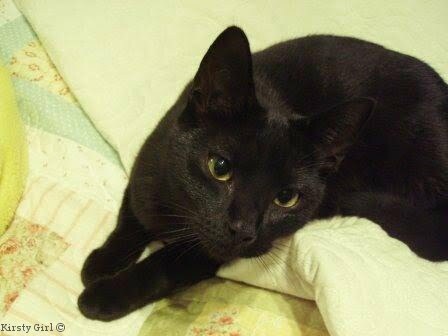 ;) My mom's cat could be his twin!! Thanks so much for the visit to my blog...glad you like the title. ;) Hope you'll swing by again sometime soon! Quilts are gorgeous and dear puss, but go bake that pie- I'm waiting for the recipe....mmmm Lemon Meringue pie... just delicious! 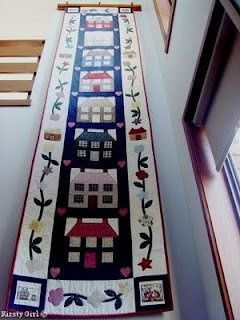 That quilt is gorgeous and what a wonderful keepsake! Thanks for sharing! Kirsty your quilt is beautiful. I love quilts and have several my Mom has made. They come with a lot of love sewn into them. I love your Duke!! Beautiful quilts! And adorable kitty!